Accentuate the long and lovely line of your legs with ease in the eye-catching Sam Edelman Amelia caged sandals. Suede upper. Lace-up design. Open-toe, caged silhouette. Man-made lining and footbed. Wrapped stiletto heel. Man-made sole. Imported. Measurements: Heel Height: 4 in Weight: 8 oz Product measurements were taken using size 7, width M. Please note that measurements may vary by size. Weight of footwear is based on a single item, not a pair. Bask in sunny skies and warm breezes in style with the versatile Avery sandal. Leather and textile upper. Adjustable buckle ankle strap closure. Open-toe silhouette. Cork lining. Lightly padded footbed. Man-made, jute wrapped sole. Imported. Measurements: Heel Height: 1 in Weight: 8 oz Platform Height: 1 in Product measurements were taken using size 7, width M. Please note that measurements may vary by size. Weight of footwear is based on a single item, not a pair. 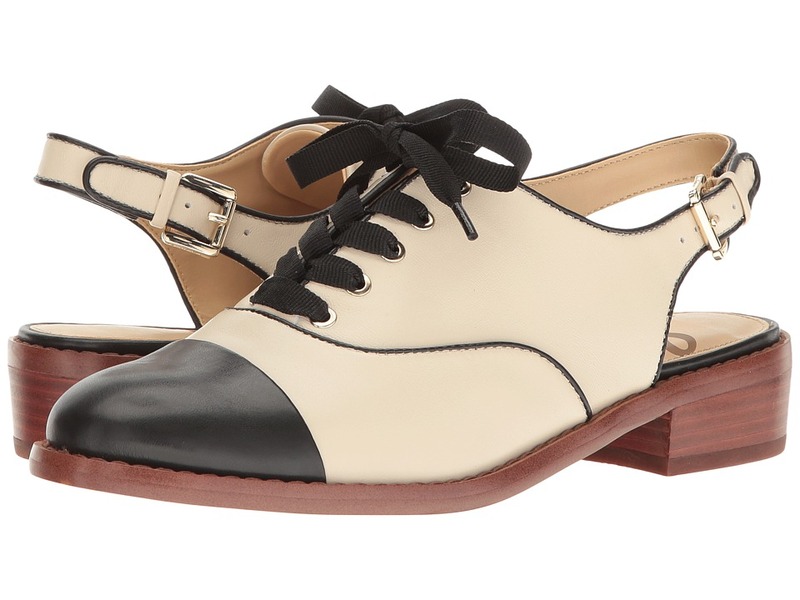 Polish off your professional look with these perfectly posh Damian slingback oxfords. Leather and synthetic upper. Oxford silhouette with cap-toe. 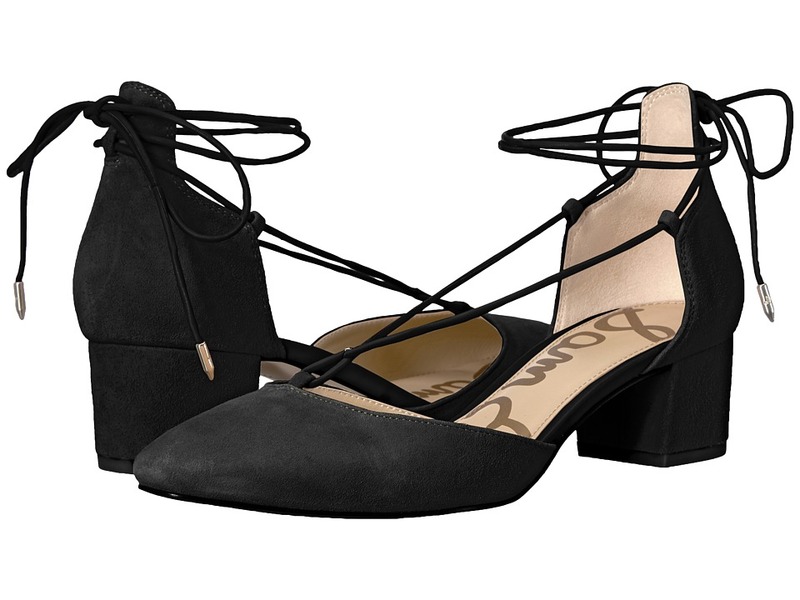 Lace-up closure with adjustable ankle strap. Leather and synthetic lining. Lightly cushioned man-made footbed. Stacked heel. Man-made sole. Imported. Measurements: Heel Height: 1 1 4 in Weight: 12 oz Platform Height: 1 4 in Product measurements were taken using size 7.5, width M. Please note that measurements may vary by size. Weight of footwear is based on a single item, not a pair. Make the fashion forward choice with the Sam Edelman Evie heeled shootie. Perforated man-made upper. Adjustable buckle strap closure. Round-toe silhouette. Open heel design with peep-toe. Man-made lining. Lightly cushioned insole. Man-made outsole. Stacked block heel. Imported. Measurements: Heel Height: 3 1 4 in Weight: 9 oz Product measurements were taken using size 7, width M. Please note that measurements may vary by size. Weight of footwear is based on a single item, not a pair. 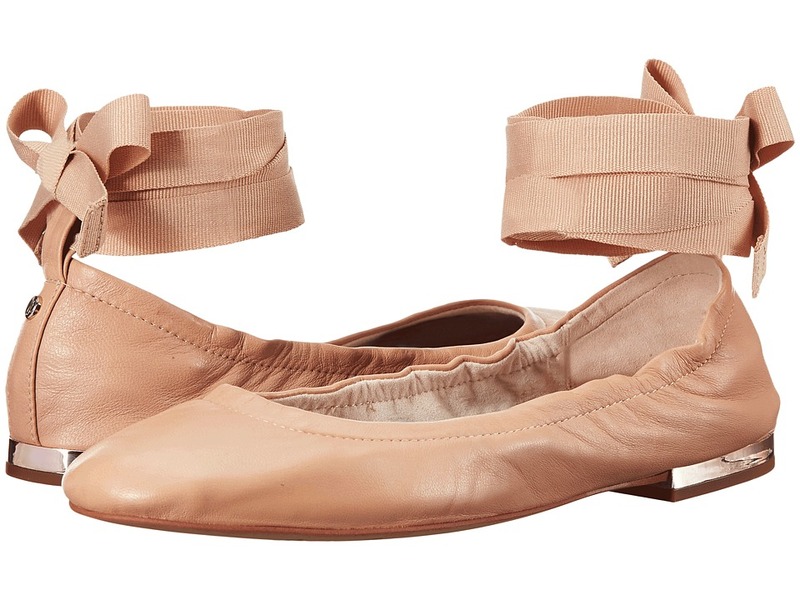 Make your day a whole lot better with the Sam Edelman Fallon. Leather upper with ankle wrap. Round toe. Man-made lining. Lightly cushioned footbed. Slip-on silhouette. Man-made outsole. Imported. Measurements: Heel Height: 1 2 in Weight: 5 oz Product measurements were taken using size 7.5, width M. Please note that measurements may vary by size. Weight of footwear is based on a single item, not a pair. Your favorite flat gets a trendy new upgrade! Say hello to Felicia 2! Perforated suede upper. Slip-on design with elasticized collar for all-day confort. Round-toe silhouette. Bow accent at toe with signature logo detailing. Leather lining and insole. Lightly padded footbed. Mini stacked heel. Leather sole with rubber heeltap. Imported. Measurements: Heel Height: 0 1 in Weight: 4 oz Product measurements were taken using size 7, width M. Please note that measurements may vary by size. Weight of footwear is based on a single item, not a pair. 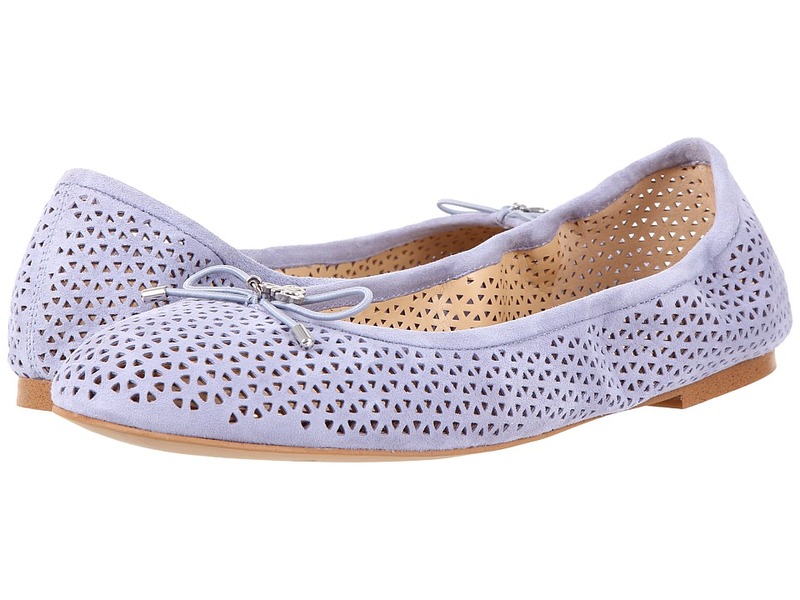 Add some ghillie goodness to your glamour with the Sam Edelman Flynt flat. Leather and textile upper depending on colorway. 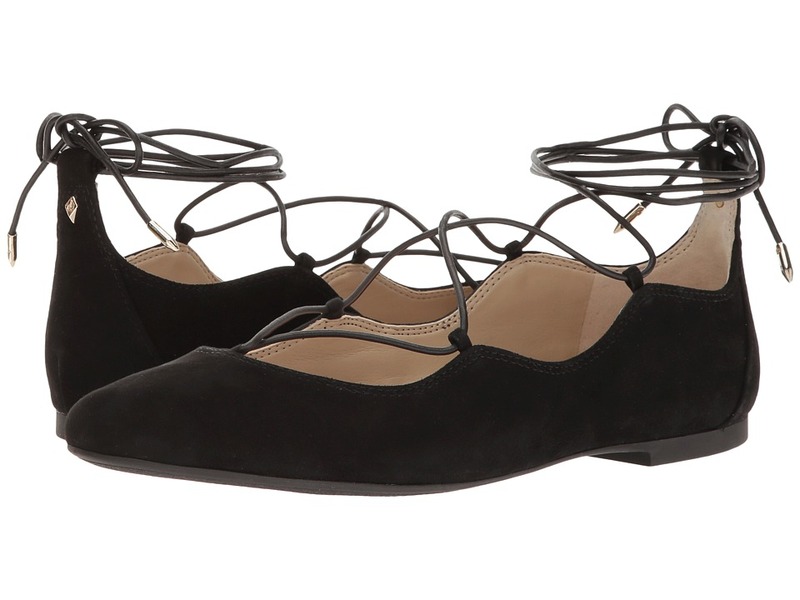 Ghillie ankle lace-up closure. Round-toe silhouette. Leather lining and insole. Lightly cushioned leather footbed. Micro heel. Flexible man-made sole. Imported. Measurements: Heel Height: 1 4 in Weight: 5 oz Product measurements were taken using size 7, width M. Please note that measurements may vary by size. Weight of footwear is based on a single item, not a pair. Add some flair to your favorite outfits with the Leya from Sam Edelman. Leather or textile upper depending on colorway. Faux-fur pom-poms. Round-toe silhouette. Man-made lining. Lightly cushioned insole. Man-made outsole. Slip on. Imported. Measurements: Weight: 14 oz Product measurements were taken using size 7.5, width M. Please note that measurements may vary by size. Weight of footwear is based on a single item, not a pair. 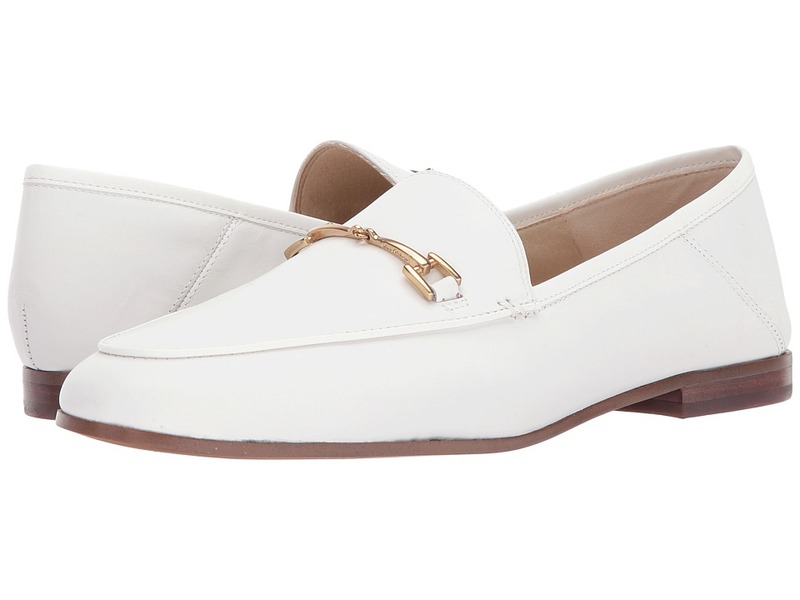 The lovely Loraine loafer is a classic addition to the Sam Edelman lineup! Supple leather or textile upper depending on colorway. Slip-on design. Traditional round-toe silhouette. Metallic branded vamp detail. Leather lining and insole. Lightly padded footbed. Leather outsole with rubber heeltap. The brand advises that this style runs slightly large and recommends ordering a half size down. Imported. Weight of footwear is based on a single item, not a pair. 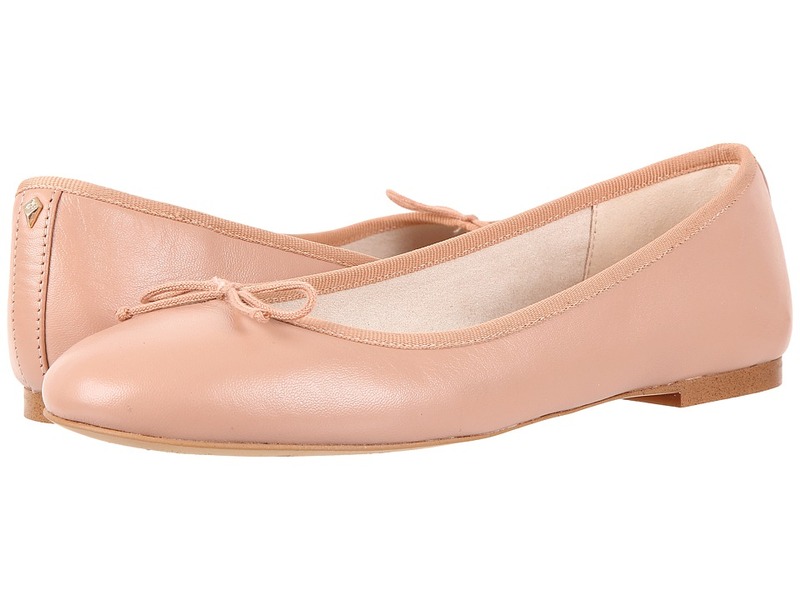 Simplicity gets an update with the sweetly styled Sam Edelman Loretta pump. Suede or textile upper depending on colorway. Ghillie lace-up design. Almond-toe silhouette. Man-made lining and footbed. Wrapped block heel. Man-made sole. Imported. Measurements: Heel Height: 1 3 4 in Weight: 8 oz Product measurements were taken using size 7, width M. Please note that measurements may vary by size. Weight of footwear is based on a single item, not a pair. Sunny days are just around the corner. Transition into riveting style with the dynamically designed Sam Edelman Seana slingback sandal. Leather upper. Ankle strap with adjustable buckle closure. Round-toe silhouette with open toe and heel. Scalloped crossover straps with metallic rivet detailing. Man-made lining. Lightly cushioned footbed. Wrapped block heel. Man-made outsole. Imported. Measurements: Heel Height: 2 1 2 in Weight: 9 oz Product measurements were taken using size 7, width M. Please note that measurements may vary by size. Weight of footwear is based on a single item, not a pair. 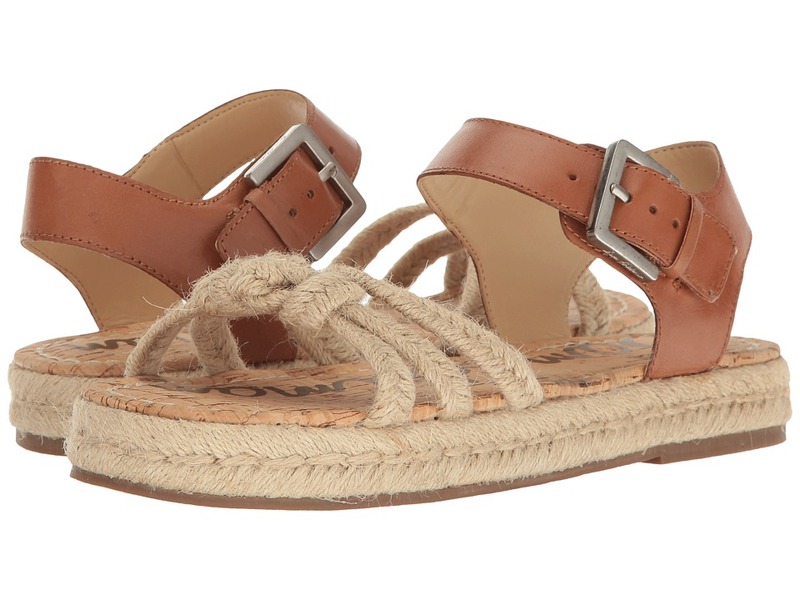 Achieve a chic look sure to garner plenty of attention in these Sam Edelman Serene lace-up sandals. Suede leather upper. Lace-up design. Open-toe. Man-made lining and footbed. Wrapped block heel. Man-made sole. Imported. Measurements: Heel Height: 2 1 4 in Weight: 9 oz Product measurements were taken using size 7, width M. Please note that measurements may vary by size. Weight of footwear is based on a single item, not a pair. Sunny days are just around the corner. 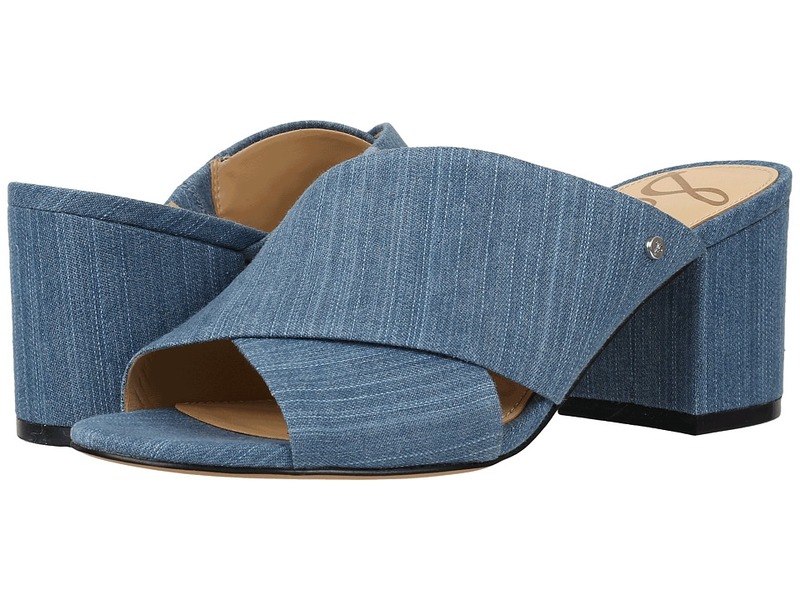 Transition into timeless style with the versatile Sam Edelman Stanley slide. Crisscross suede or textile upper. Slip-on design. Round-toe silhouette with open toe and heel. Man-made lining and insole. Lightly cushioned footbed. Wrapped block heel. Man-made outsole. Imported. Measurements: Heel Height: 2 1 4 in Weight: 9 oz Product measurements were taken using size 7, width M. Please note that measurements may vary by size. Weight of footwear is based on a single item, not a pair. 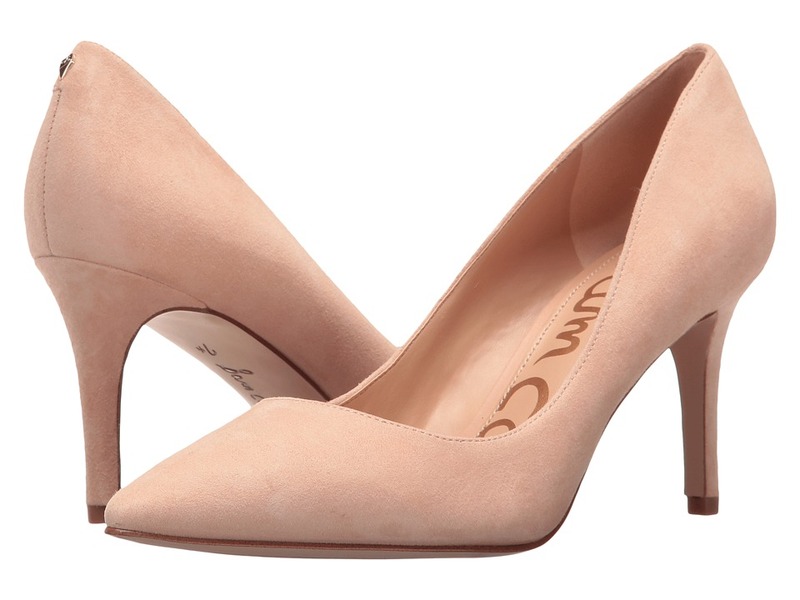 Put your best fashion foot forward in the classically-inspired Tristan pump. Supple suede upper. Slip-on design. Point-toe silhouette. Man-made lining and insole. Lightly cushioned footbed. Wrapped stiletto heel. Man-made outsole. Imported. Measurements: Heel Height: 3 in Weight: 7 oz Product measurements were taken using size 7.5, width M. Please note that measurements may vary by size. Weight of footwear is based on a single item, not a pair. These Sam Edelman Yaro heeled sandals give you a stylish edge over the rest! Leather, suede or textile upper depending on colorway. Halo strap with adjustable buckle closure. Round, open-toe silhouette. Man-made lining and insole. Lightly cushioned footbed. Wrapped block heel. Man-made outsole. Imported. Measurements: Heel Height: 4 in Weight: 10 oz Platform Height: 1 4 in Product measurements were taken using size 8.5, width M. Please note that measurements may vary by size. Weight of footwear is based on a single item, not a pair. 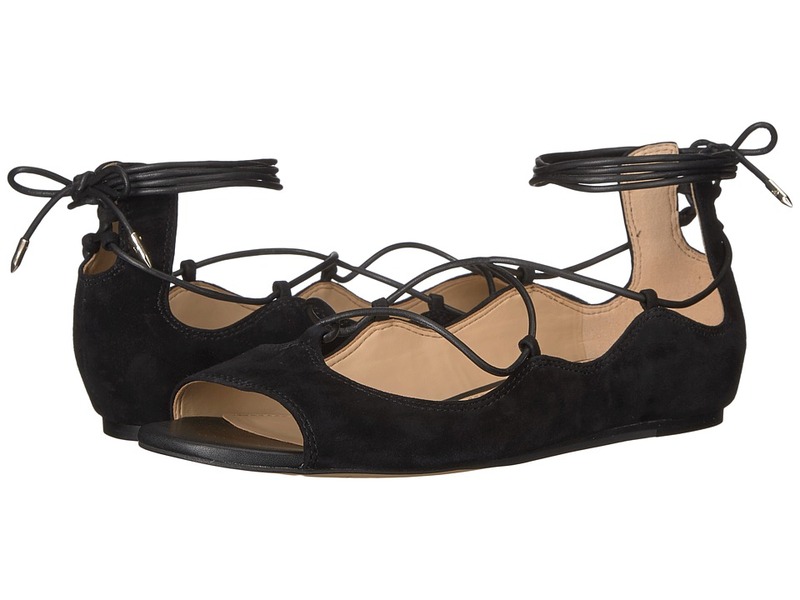 Dress up your everyday look in the on-trend Yasmina sandal. Suede upper. Back zippered closure. Open toe. Buckled straps along shaft. Man-made lining. Lightly padded footbed. Wrapped block heel. Man-made sole. Imported. Measurements: Heel Height: 3 3 4 in Weight: 11 oz Product measurements were taken using size 7, width M. Please note that measurements may vary by size. Weight of footwear is based on a single item, not a pair.